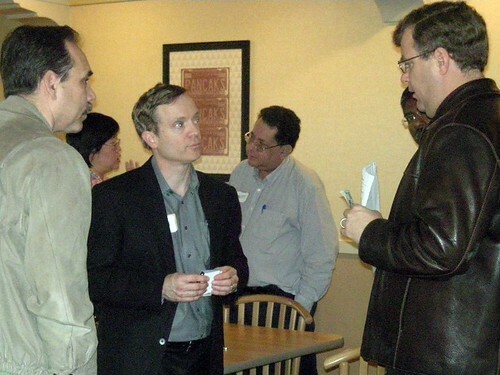 I went to a breakfast meeting of the PM PM SIG (Project Management Special Interest Group) today to hear Kevin Thompson of cPrime talk about “Wideband Delphi (Agile) Estimation for Project Managers”. 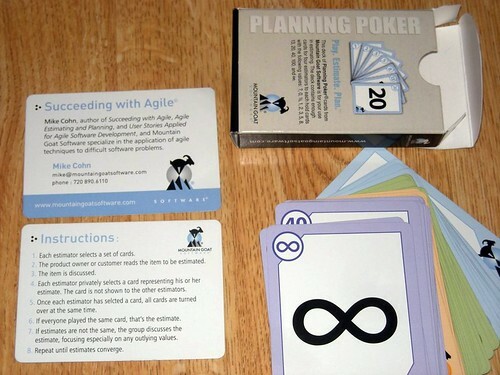 It turned out to be a fun talk about an easy-to-use estimating tool called Planning Poker by Mountain Goat Software. I was surprised by the similarities between the Planning Poker estimation method and the participant selection method we have used for many years for Sun’s SEED worldwide Engineering mentoring program. Planning Poker is based on the Delphi estimation method pioneered by the Rand Corporation in the 1940s, then refined by Barry Boehm in the 1970s. A Facilitator asks each estimator to pick one numbered card from their set (each card has one number: 0, 1/2, 1, 2, 3, 5, 8, 13…). This method reduces bias of team members just agreeing with each other’s estimates for social or hierarchical reasons. Since everyone picked his number card in private then turned over the cards simultaneously, each had to make a first estimate based on his own understanding. Each SEED application is read independently by at least two executive Selection Committee members. Each member ends up reading about the same number of applications. Each Applicant is ranked H-High, M-Medium or L-Low, with roughly 1/3 of the names in each category. For example, if there were 84 applications and 7 on the committee, if the goal is 40 Participants, each Selection Committee member would read 24 applications and have more-or-less eight High, eight Medium, and eight Low rankings to distribute. Discussions are often around differences of interpretation of the application materials and relative value to Sun Engineering of the applicant. Energetic discussions happen when the same Applicant is rated High by one and Low by another. Another common discussion is about how many Medium/Mediums to include to achieve an appropriate and balanced diversity among the Participants. Diversity of demographics, geography, and professional area are all considered. All SEED applicants rated H,H and M,H and L,H are accepted and also some rated M,M. SEED does not accept applicants rated L,L (low by both reviewers) or M,L. Because the Selection Committee are all executives who may be rating staff reporting to other committee members, keeping the ratings private until the actual phone meeting helps reduce bias of members just agreeing with each other’s ratings for social or hierarchical reasons. As with Planning Poker, discussions start with outlying values rather than discussing all the details and assumptions for each rating. Using Planning Poker or the SEED selection method means that potentially complex decisions can be made very quickly and with relative ease. This makes it easier to recruit team members, especially in the case of SEED where the members are very busy executives. Read more about the SEED mentoring program in Sun Mentoring: 1996-2009 by Katy Dickinson, Tanya Jankot, and Helen Gracon (Sun Labs Technical Report TR-2009-185, August 2009).